Supports all 2.5 and 3.5 inch SATA (Serial ATA) I, II, and III hard drives, solid state drives, and hybrid drives up to any capacity (8TB+). Please note that IDE/EIDE/PATA, SCSI, SAS, mSATA, and M.2 drives are not supported. No disk drive is included with purchase. The Plugable USB3-SATA-UASP1 is a unique single SATA drive bay docking solution that features a convenient toolless design as well as hot-swap support and driver-less, plug and play installation. 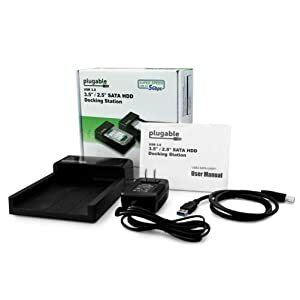 The docking station supports all 2.5 and 3.5 inch SATA I, II, and III hard drives, solid state drives, and hybrid drives up to any capacity (8TB+) using the ASMedia ASM1153E SATA to USB 3.0 bridge chipset and firmware with USB Attached SCSI protocol (UASP) and bulk-only transfer (BOT) transfer support for maximum features and performance. The ASM1153E is a third generation single chip solution that uses advanced process technology to optimize the chip's power consumption over previous generations. The UASP1 is perfect for a wide array of tasks and has many advantages over traditional external hard drives. Some of the most common uses include recovering data off of disk drives pulled from non-working computers, cloning drives, and using inexpensive original equipment manufacturer (OEM) drives to use as rotating and off-site backups. Any standard SATA interface drive is supported from traditional 3.5 inch mechanical spinning disk drives to 2.5 inch solid state drives. Hybrid drives (combination spinning disk and solid state) are also supported. Up to 8TB drives have been confirmed compatible and the dock supports LBA48 (logical block addressing) addressing mode which should support drives as large as 128 PiB (Pebibyte) assuming the host computer operating system supports drives of that size. 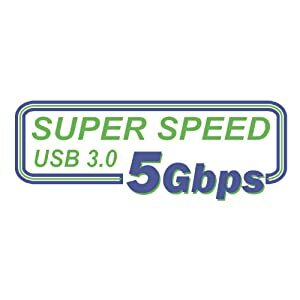 The UASP1 connects via SuperSpeed USB 3.0 with up to 5Gbps (640MBps) of bandwidth available, up to 10x as fast as USB 2.0 at 480Mbps (60MB/s). Real world transfer rate performance will vary depending on the host computer USB 3.0 controller and disk drive performance specifications. For USB 3.0 speeds the docking station must be connected to a USB 3.0 port but is backwards compatible with older USB 2.0 and 1.1 systems at slower speeds. 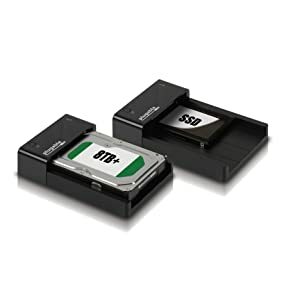 Both BOT (Bulk-Only Transfer) and UASP (USB Attached SCSI Protocol) data transfer methods are supported for even faster drive data performance. Unlike older docking stations, the UASP1 does not use problematic sector emulation techniques, instead it has been flashed with the latest firmware to support LBA48 addressing mode, Advance Format disk drives, and GPT (GUID Partition Table) format for larger than 3TB drives. 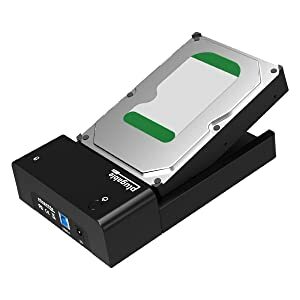 Constructed of heavy duty ABS plastic, the open horizontal docking bay was designed for hassle free docking and undocking of bare/internal SATA disk drives with no wires to connect. Dual color LED reports drive activity (blue for power, red for drive activity). Power button for powering off drive when not in use. Drive sleeps automatically after 10 minutes of idle time to conserve power and reduce heat. Included with the UASP1 is a robust 30W (12V, 2.5A) UL certified power supply that fits US, Canadian, and Japanese AC wall outlets. In addition the power supply supports 100-240V at 50/60Hz. With an AC outlet adapter (not included) it can be used worldwide. Also included is a 3 foot/1m USB 3.0 A to B cable to connect the dock to the host computer. No drivers are required for the docking station itself as it uses the standard USB mass storage class support already provided in Windows XP through 10, Mac OS X, and Linux / Unix. Windows XP through 7 users are encouraged to install updated USB 3.0 xHCI host controller drivers for best performance and stability. UASP functionality requires a UASP capable USB 3.0 host controller and operating system. Supports 8TB+ drives on 64-bit operating systems (drives less than 2TB suggested for 32-bit Windows). Please note that new/blank disk drives must be initialized, partitioned, and formatted. 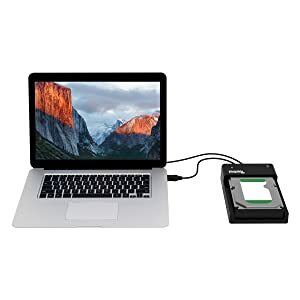 Mac and Windows computers cannot read Linux/Unix formatted hard drives (commonly found in network attached storage 'NAS' devices) without special software. For more information see the how to links at the top of the product page on our website.